Sorry, the message has been sent by error before I finished to write it. I was waiting to receive the message to reply to it, but it seems the message is not sent to the original author. 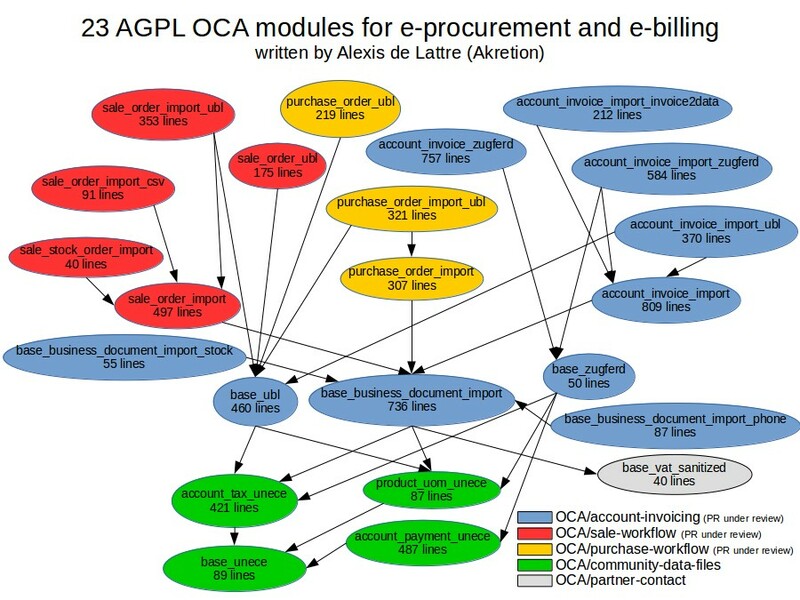 In a recent twitter conversation, Stéphane Bidoul suggested that the modules that I developped for e-orders and e-invoices should be in a dedicated repo, because he thinks that they are spread across too many different OCA repo which make it difficult to maintain. So we could create a new repo where we would at least group the modules that are in the 3 pending PR on sale-workflow, purchase-workflow and account-invoicing ; these modules are the bigger part of my work. The other modules in the repos community-data-files and partner-contact would stay where they are. The localisation modules always stay in their localisations. I don't have a good name to suggest so far for this new projet. My only ideas are: "electronic-documents" or "edi".